IDEB and CPSC Officials in the Discussion Meeting Ceremony. 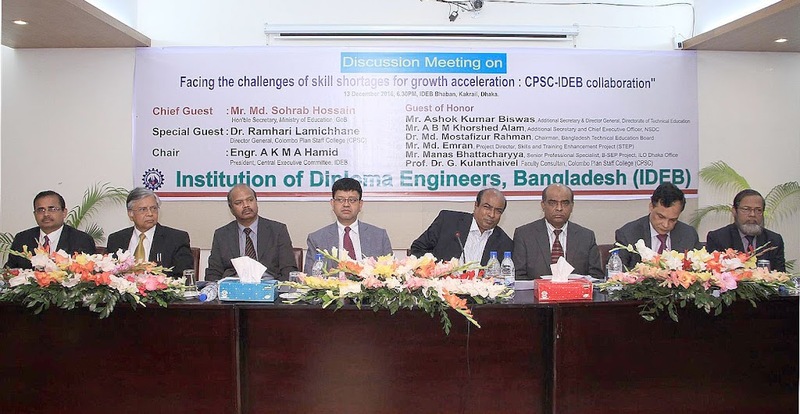 The Colombo Plan Staff College and the Institution of Diploma Engineers Bangladesh (IDEB) held a discussion meeting at IDEB Bhaban in Dhaka on December 13, 2016 to discuss possibilities for future collaborative engagements. Representing CPSC was Dr. Ramhari Lamichhane, CPSC Director General and Prof. Dr. G. Kulanthaivel, CPSC Seconded Faculty Consultant. IDEB was represented by Engr. A.K.M.A Hamid, President, IDEB Central Executive Committee. Mr. Md. Sohrab Hussain, Honorable Secretary of the Ministry of Education, was invited as chief guest for the meeting. Other invited guests of honor included: Mr. Ashok Kumar Biswas, Additional Secretary and Director General of DTE; Mr. A.B.M Khorsed Alam, Additional Secretary and CEO of the National Skills Development Council (NSDC); Dr. Md. Mostafizur Rahman, Chairman of the Bangladesh Technical Education Board (BTEB); Mr. Md. Emran from Skills Training Enhancement Project (STEP) and Dr. Haripada Das, ILO Dhaka Program Officer. The meeting drew up vital agreements and affirmations of support from IDEB, CPSC's honorary member organization since 2014. It also touched on ways how to address emerging challenges of skill shortages in the member countries, as well as the enhancement of TVET's role in accelerating economic growth and sustainable development. IDEB is a national organization of all Diploma Engineers who graduated from the different polytechnics and technical institutions under the Bangladesh Technical Education Board and Engineering College in Dhaka University. Established in 1970, the institution, currently, has more than 400,000 members that are ubiquitously involved in projects not only in Bangladesh but also in the entire Asia-Pacific region. Dr. Lamichhane (right, standing) deliver his speech of solidarity with the vision of IDEB during the meeting.